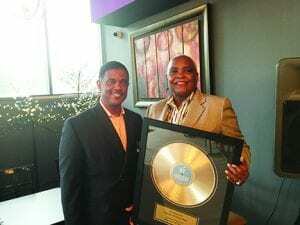 l-r; Pastor Howard Jones, congratulates Dr. Deborah Cole on her Golden Record Award. NASHVILLE, TN — The event was held Saturday, Oct. 7 at Kingdom Cafe & Grill and was filled with joy and humble appreciation to be recognized. One Nashville held the awards event on behalf of Minority Enterprise Development Week Business Recognition Breakfast. Dr. Deborah Cole, president/CEO of Citizens Bank, Scott and Malik Davis of the Nashville Pride and Loraine Segovia-Pazof LaNoticia newspapers and Marilyn Robinson of the Minority Enterprise Center were the award recipients. Kia Jarman and Ashley Northington served as MC’s.